The thing about living at the foot of a mountain is that it’s often windy. Sometimes it’s little more than a gentle breeze that will tousle your hair. Other times it’s enough to make you pull your ball cap down a little tighter. And then there are the winds that don’t simply blow but rage. Like the ones last Wednesday. I was outside the next morning surveying the damage, which wasn’t all together bad. The only things out of place were a few of the Christmas decorations—two bows that had found their way into the rose bushes, a strand of lights that had been blown from the tree, and a toppled Nativity scene. The bows and lights were simple enough, though I had to impale my thumb on a thorn and smack myself in the face with a tree branch in order to set aright what the wind had blown askew. Mary, Joseph, a wise man, and a shepherd had dog piled the holy child to shield him from harm. I stood the shepherd up first, brushing away a few leaves and a clump of mud. Then the wise man, then Joseph, and finally Mary. Then I stooped down to brush off little Emmanuel. Halfway into my crouch, I stopped. In a strange act of contortion I didn’t believe was possible, I both furrowed my brow and bulged my eyes at the sight before me. Because there, right there where the swaddled babe was supposed to be, was nothing. The rusty gears in my head began to lurch and churn, the results of which seemed to be subtle variations of one question—And what’s that mean? And what’s that mean? The dog pile didn’t work. And what’s that mean? My Baby Jesus is gone. And what’s that mean? Uh-oh. I stood up and looked around. Nothing. Looked under the truck and around the corner of the house and in the neighbor’s yard and by the creek. Nothing. A chill ran down my spine that could have either been panic or the last remnants of the cold December wind the night before. How could we have Christmas without the Baby Jesus? What now? I entertained a brief thought that I should call in and take the day off (“Jesus is MISSING!” I would say). But I didn’t. I wasn’t worried. After all, I’d found the real one. Surely I could find a plastic one, too. I didn’t get much done that day; I was paid more for eight hours of worry and dread than actual work. My children were ignorant of the situation for obvious reasons. 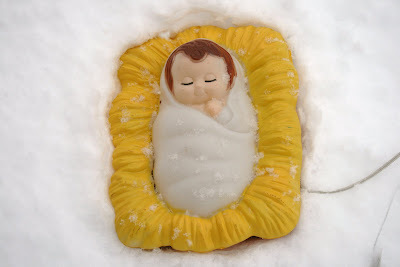 A missing Baby Jesus would bring the sort of panic that children display in tears and snot. Which meant I would have to find him before they knew he was missing. I had given up and begun preparing my failed-father speech to the family when I spotted a hunk of plastic beneath an evergreen tree. I’d be lying if I said there was a golden ray of light shining down upon it, but it sure felt that way. I sprinted over to the tree, pulled back a dangling branch, and lo and behold, there he lay in peaceful plastic slumber. My Baby Jesus is back where he belongs now, safely tucked just under the living room window with ma and pa watching over him. And also two carefully placed stakes holding him in place. I just checked on him. Still there. But a thought came to my mind as I peered through the curtains—shouldn’t I be more mindful of where the real Jesus is than my plastic one? Shouldn’t I make sure that He, too, is right beside me? And in those times when I find He isn’t, shouldn’t I go looking for Him with the same sense of purpose and urgency that I did with a simple Christmas decoration? Yes, I think. Very much so. Because the winds rage not just outside my window, but inside my heart, too. They howl doubt and blow jealousy. They gust fear. And while those winds can never blow Jesus away from me, they’ve been known upon occasion to blow me away from Him. Oh, and yes. If you’ve by chance read my latest novel In the Heart of the Dark Wood, you’ll notice that this tale may have a familiar ring to it. What can I say? To a writer, everything is a potential story. 1st Mary & now Jesus! WOW! Cool sharing.And Billy, Jesus lives inside you!